Just like comfort foods, there are “comfort authors” - those writers whose books you seek out for comfort reading because of the familiarity and simplicity of their writing style. My go-to comfort authors have always been Ruskin Bond and R.K. Narayan. 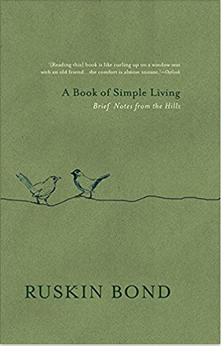 I picked up this book “A book of Simple Living" based on a tweet recommendation. One of the best books of Ruskin Bond I have read so far. It is a collection of moments from Ruskin Bond’s life - living in the hills, his study, long walks, interaction with nature - plants, trees, birds and animals, friendship, love etc. There were so many interesting lines and phrases in this book that I ended up highlighting so many of them in my Kindle. Simple prose, beautiful explanation, vivid imagery - these are the factors that keep pulling me back to Ruskin Bond’s books. One of the ideas that I picked up from this book is this “Book of trivets” - a collection of happy moments and thoughts that one can jot down, and can later refer back to relive those moments again. If you like simple writing that is appreciative of nature and slow life, then you’d love this book. Do pick it up. It is available on Kindle Unlimited.